“CityPass” è la card elettronica dedicata a turisti e residenti, nata per rendere facile ed intuitivo l’accesso a numerosi servizi di utilità in ambito urbano, che possono trasformare ogni nostra visita in un’autentica esperienza, divertente e sicura! Accesso a contenuti di approfondimento culturale e storico e sugli eventi che riguardano la città che stiamo visitando, sollecitati dalle “tellingstones“. Accesso alle migliori esperienze disponibili per un’immersione nell’autenticità dei luoghi che visitiamo. CityPass può essere ospitata nei borsellini elettronici dei cellulari (Wallet) assieme alle carte credito ed alle carte fedeltà che già possediamo. Tuttavia, per avere il meglio dalla card “CityPass”, suggeriamo di scaricare anche la app: “CityWallet”, disponibile gratuitamente negli store IOS ed Android. 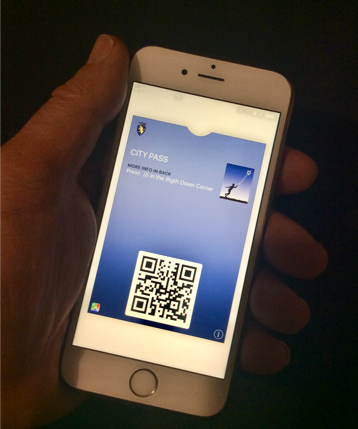 The “CityPass” is an electronic card available for IOS and Android. Once Installed within a “Wallet” App, it allows the access to a variety of services developed for tourists and residents, covering several needs: from the mobility and the easy access to museum, events and public services, up to the payment of local duties, and the discovering tourism, with the access to the best, immersive experiences. It is totally respectful of the privacy: no personal data will never requested and stored out of the mobile device where the CityPass is installed. Each CityPass is unique and created “on request” for a each user. It is free and wherever it is downloaded and installed, it is valid all over the world! The CityPass is compliant with all standard “Wallet” apps, available for IOS and Android and it is possible to install a downloaded CityPass on any of those Apps. Nevertheless, to experiment the best of the services made accessible through the “CityPass”, we suggest to use the enanched Wallet, called “CityWallet”.